Giallo Vicenza granite is quarried in Brazil. This slab is named Leathered because of its finish. Leathered-look surfaces offer a different look and feel. 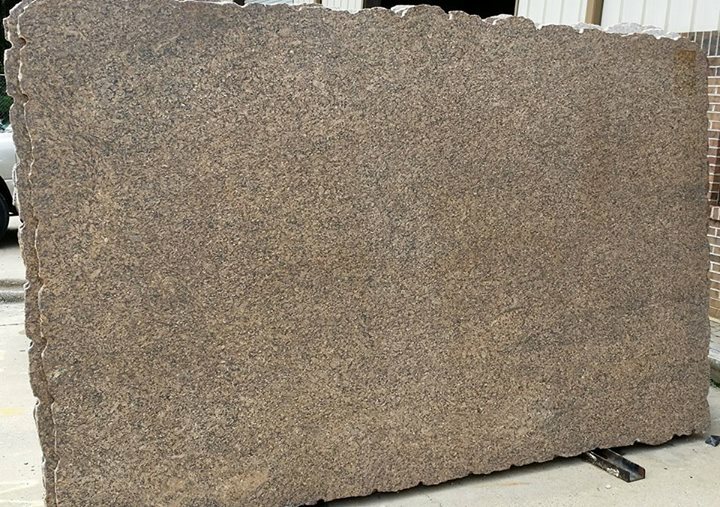 It is most commonly seen on darker granites and gives the stone a textured appearance while still keeping its natural color. It is still a beige/gold colored granite with specks of black, brown, gold, and translucent quartz throughout the slab. It remains very consistent and uniform in color with medium variation. A leathered countertop usually has a soft sheen to it, but is much less shiny than the glossy look of a polished slab. Leathered granite countertops tend to be low maintenance because it hides fingerprints, water spots, and smudges very well.